Badurina families are Croats and they are mostly from the Island of Pag. In the past century, relatively most of Croatian residents bearing this family name were born in Rijeka and on the Island of Rab. In Lun on the Island of Pag every third inhabitant had the family name Badurina. About 490 people with faimily name Badurina live in Croatia today, in 240 households. There were 520 of them in the middle of the past century, and their number decreased by 10 percent. They are located in the most of Croatian counties, in 29 cities and 41 other places, mostly in Lun on the Island of Pag (140), Rijeka (110), Zagreb (60), Mali Losinj on the Island of Losinj (35), and in Novalja on the Island of Pag (15). At least 42 families with this surname emigrated from Croatia to: the United States (16), France (9), Germany (9), Canada (3), Argentina (2), Sweden (1), Uruguay (1), and to Switzerland (1). Family name Badurina is present in 17 countries worldwide. The family name "Badurina " is used by some 100 people in the United States , small number in Korea (South) , and small number of people in Russian Federation. 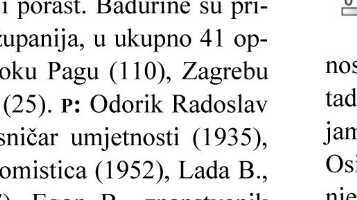 In the sources analysed in the project Acta Croatica so far, the name is mentioned over five times, the first time 2007 in source Encyclopaedia of Croatian Surnames.